Founded in Baltimore in 1985, Living Classrooms Foundation is a Baltimore – Washington, DC nonprofit that disrupts the cycle of poverty and makes our community safer, stronger, and healthier by meeting individuals where they are and building skills for life. 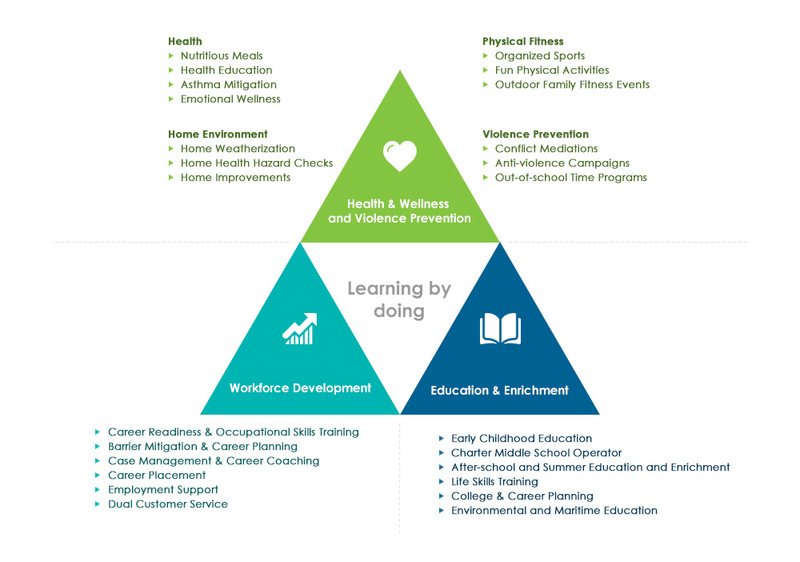 Living Classrooms inspires children, youth, and adults to achieve their potential through hands-on education, workforce development, health and wellness, and violence prevention programming. We work with one child, one teen, one adult, and one family at a time to identify existing barriers towards success and provide resources and opportunities to help each person reach their full potential, thus creating stronger family units and more resilient communities. While each of our program areas is distinct, in combination they create a powerful synergy. Our maritime heritage sites create opportunities for employment training. Our education programs use our environmental and maritime resources as living learning laboratories. Our employability programs create stronger communities that are better prepared to exercise environmental stewardship. We are dedicated to improving the lives and futures of children, youth, and families as we serve communities with holistic and transformative opportunities. We strive to build strong, equitable, and sustainable communities through effective education, workforce, and health and wellness opportunities that address deeply-ingrained challenges, and we set high expectations for academic achievement, living-wage job placement, improved community health and safety, and increased constituent engagement. We believe that every child, youth, and adult who steps through our doors has the ability to learn and the potential to be great. We recognize that the strength of the community lies in the resilience of each resident, and we nurture the abilities of all participants to achieve a positive collective impact. We believe that communities must be heard and actively involved from the very beginning. We listen, and we respond with empathy. We keep families, stakeholders, and constituents involved in our planning and programming, and we engage communities with high-quality services and opportunities. We believe that respectful and honest service, uncompromising standards, a culture of dignity and respect, and transparency in reporting are the foundation upon which we hold ourselves accountable to our supporters, our constituents, and the community. We realize that educational equity and excellence takes a diverse coalition of people united around a common purpose and shared values. As a result, we believe our efforts to transform marginalized and underserved communities must be shaped by those who are directly impacted by the educational, social, and economic inequities. In order to create progress, we believe that each of us need to work, respect, and communicate effectively with our various stakeholders (e.g., students, parents, partners) with diverse backgrounds (e.g., cultural, educational, political). Diversity is vital for successful change efforts and is one of Living Classrooms’ greatest strengths. The full potential of our diverse team will be reached only when we are an inclusive community. The success or failure of the children, youth, and adults we serve in our organization should not correlate with any social, cultural or other identity-based factors. We see every challenge as an opportunity to learn, grow, and think expansively about solutions. When faced with obstacles, we deepen our resolve, adapt, and persist with optimism.